All details are now in place so we can now advertise this event. Investing or trading in the financial markets? Looking to be more profitable? Wanting to minimise the losses? 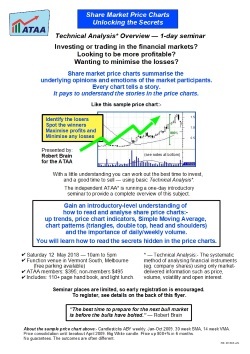 A 1-day high-level overview all about Technical Analysis, on Saturday 12 May in Vermont South, Melbourne. Seminar fee includes 110+ page hand book, plus light lunch. See more details in my Share Market Toolbox. Download the 2-page promotional flyer and registration form. Seats are limited, so don’t delay. Register pronto. This entry was posted in New and updated content log, Operations log and tagged education, Melbourne, seminar, Technical Analysis, Technical Analysis Overview, Technical Analysis Overview seminar. Bookmark the permalink.